People + Services - LightArrow Inc.
Q. How to prospect new lead? Q. How do I import data into LightArrow using CSV file? Q. How do I collaborate using Email? Q. How do I create and use a call list? Q. How do I add and use custom data fields to contacts? Q. How do I Create and use an Email Template? Q. How do I add contacts in my app? Q. How do I create and use a contact filter? Q. How do I do CRM with LightArrow Organizer? Q. How do I track household services using service providers and bill payments? Q. How can I associated contacts with various items in LightArrow? Q. How Do I Manage My Shopping Items, Products and Sellers? Q. How Do I Create Custom Statuses For Tasks, Projects, Contacts, and Assets? Q. What fields do we support when we import a Contact? Q. How can I delete items in bulk? The Contacts + Services topic is ideal for managing your contacts and services. This view is useful for anyone who wants to manage details of their contacts, and its especially useful for business people for keeping track of clients, prospects, service providers or other types of contacts. When you have several contacts, it’s difficult to find their information quickly and efficiently. In this view, you can organize your contacts into groups, such as “Friends,” “Family,” “Clients,” “Prospects,” “Students” — whatever works for your life or business, which makes it easier to manage a large number of contacts. Keep in mind, that by giving your LightArrow app access to your iOS contacts, there’s no need to manage your contacts in your device’s app AND in your LightArrow app. You can import the contact information for a new contact directly from your iOS contacts or link the information to an iOS contact. It’s challenging to manage all the service providers and services that you utilize occasionally or on a regular basis. For example, you might use the services of hair stylists, gardeners, advertising and PR agencies, auto repair shops, and others. Many people keep the details of the services and service providers by saving receipts in a file folder or saving or scanning business cards; however, it can be difficult to locate this information when you need it, and this method produces a lot of clutter. For example, you might have an air conditioning system that requires regular maintenance. With your LightArrow app, you can maintain and easily retrieve the contact information of the businesses and people who maintain your air conditioning system. Not only can you save the contact information — you can create a maintenance schedule; create reminders for services through integration with your device’s calendar; keep notes, files, photos, and videos associated with the service; bookmark online information; add checklists for things to remember; and more. Essentially, all the information you need about a contact or service is kept in one place — which saves your precious time. For the LifeTopix, My.Agenda, and Pro.Calendar apps the Pro Contacts pack adds CRM-like contact management features, including custom forms for contacts, a configurable contact grid view, and CSV import/export. It also allows data items such as tasks, appointments, reminders, notes, files, bookmarks, and expenses to be associated with contacts. For the LifeTopix, My.Agenda, and Pro.Calendar apps purchase extra contacts in packs of 100, 200, 500, 1000, or 2000. Out of the box, you can manage 100 contacts. These packs are cumulative. For example, if you purchase the 100 pack and the 200 pack at a later time, you can manage a total of 400 contacts (with the out-of-box contacts). For the LightArrow Organizer app the Pro Contacts feature is already available. However, you are restricted to the overall item limit of the app, and you may need to purchase additional item packs. Contacts: Friends, family members, businesses, clients, or other people or entities you communicate with frequently or infrequently. Groups: This is the name for a group of contacts. It can contain multiple people or businesses, and enables you to contact them via email or text all at once. iOS Contacts: Contacts that are accessed on your iPhone, iPad, or iPod touch. You can view these contacts directly from this view. Service Providers: Companies, organizations, or individuals from whom you receive a service. For example, AT&T may be the company that provides your mobile telephone service, State Farm insures your car, you stream movies from Net­flix, or Dr. Welby is your personal physician. Services: Work or help that you receive from others such as personal care, auto care, home maintenance, contract work, etc. Touchpoints allow relevant information to be shared seamlessly between Contacts + Services and other topics. For example, if you have services you want to use for events you’re planning, you can specify the services directly from within Events + Appointments and that information will automatically be available from within Contacts + Services. The same is true for project services that you define in Tasks + Projects — services you receive for your home and other possessions defined in Home + Assets; services you consume for your learning activities in Education; online services you access, and so on. You can even specify your healthcare service providers from within Health + Goals and the establishments you like to frequent from within Travel + Places. In addition, you can create contacts automatically from My Inboxes when you’re gathering information from social, web, and email channels. Categories are available for use with service providers and services. You can create, modify, hide, or delete categories via Settings or directly from a tile for a Service Provider or Service. When a category is deleted, it is completely removed from your app. When a Service Provider category is hidden, it no longer appears in the Categories tile, but it remains defined, and is still available in the category list when you’re defining a new Service Provider or Service. Note that categories that are in use or serve as touchpoints to another topic cannot be deleted or hidden. For information about creating categories, refer to your help for Manage Categories. Alerts display at the top of the Contacts + Services view for anything related to contacts, services and service providers that are due within the next five days or are currently overdue. For example, if you’ve set a birthday date for any of your contacts, an alert displays to let you know that a birthday is coming or overdue. Or, if you’ve created a reminder to set up a yearly eye exam, an alert shows. Also, if you’ve created a contact log item that has the response type set to date, and if the contact log item isn’t completed then the date can cause it to show up as an alert. 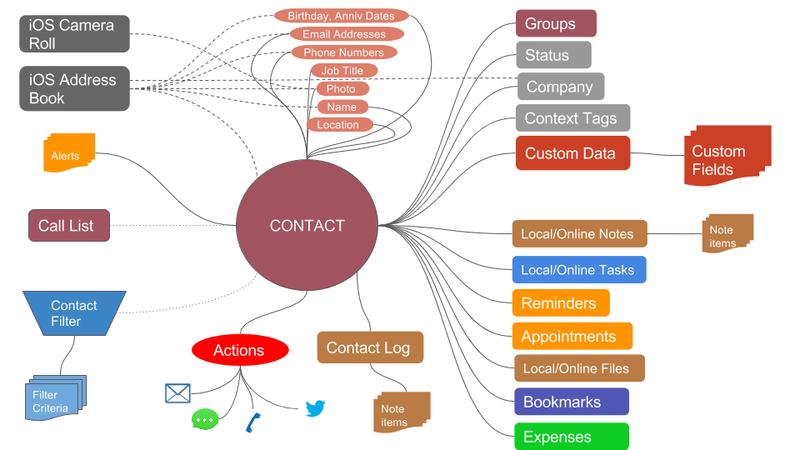 To learn more about managing contacts, refer to Contacts. iOS contacts are contacts that are accessed on your iPhone, iPad, or iPod touch from your built-in contacts app. You can view these contacts directly from the iOS Contacts view, which is accessed by tapping the iOS Contacts tile from the Contacts + Services view. In the Contacts + Services topic, a “group” is a convenient way to maintain a logical collection of related people from your device’s contact’s app. Groups allow you to organize your contacts into segments, such as “Friends,” “Family,” “Clients,” “Prospects,” “Students” — whatever works for your life or business, which makes it easier to manage a large number of contacts. It’s also useful to create groups of contacts when you need to communicate with the entire group via email or text. Note: It’s a good idea to add contact groups before adding contacts from your iOS contacts because it allows you to import multiple contacts from your device all at once. In the Contacts + Services topic, tap the plus sign, and then tap Group. Add a name for the group. If you wish to add more data, such as members of the group tap Create and Add More Data. Tap Members, and then select all the users you wish to add to the group by tapping them. For your convenience, you can add contacts to groups in several ways, such as from the person’s Contacts view or directly from the Groups view. In the Contacts + Services topic, tap the Groups tile. Locate the group that you want to add members to, tap it, and then tap Open. If you wish to modify the title, tap it to edit it. Locate the group you wish to delete and tap it. The Contacts + Services view increases your productivity by allowing you to interact directly with your contacts while in context with the items that are associated with them. For example, you might be viewing a task that is directly associated with a contact, but you’re not required to leave the app to contact this person while your thinking about this important task. Through your LightArrow app, you can call, email, or send a text message directly from the contact. In addition, if you want to communicate with a group of contacts at once (such as invitees to a party), your LightArrow app makes it easy to do so. In the Contacts + Services view, tap the Contacts tile. Locate the contact you wish to communicate with, and tap it. Tap Call, Email, or Text, depending on the communication. Finish the process by completing the fields. In the Contacts + Services view, tap the Groups tile. Locate the group you wish to communicate with, and tap it. Tap Email or Text, depending on the communication. Service Providers are companies, organizations, or individuals from whom you receive a service. For example, AT&T may be the company that provides your mobile telephone service. Or, State Farm insures your car, you stream movies from Net­flix, or Dr. Welby is your personal physician. For service providers, you can manage information such as location, online access (bookmarks/usernames/passwords), referred by, context tags, and categories. Refer to Service Providers to learn more about creating Service Providers. Services are products or labor you receive from companies, organizations, or individuals. Household utilities, yoga instruction, lawn care, and newspaper subscriptions are all examples of services. You can sort the list of services by tapping the Services tile. This view shows you, at-a-glance, all the services that are defined. Preset services are initially shown and you’re welcome to edit or remove them. If you have created services, each of those and all the preset services are listed, sorted alphabetically by default. You can decide how the services are viewed (such as by Category, Last Updated, etc.) by using the menu in the upper left. Refer to Services to learn more about creating Services. A contact filter allows you to create a dynamic, up-to-date view of contacts matching the criteria that you have specified in the filter. For example, if you want to see all the contacts that have been contacted in the last 30 days you can accomplish that by creating a contact filter. To better manage your contacts, you can add custom fields and log forms to their contact records. For example, imagine that you’re a personal trainer and you’re managing a large number of clients. You want to make sure that they’re progressing; therefore, with custom fields, you can track their weight and other stats directly in their contact record. If you wish to combine custom items, you can create a log form and combine the items together. CONCEPTUAL EXAMPLE: When you create custom fields, you have to create a form and include them. The form makes those available in the Contact detail. For example, you may have a form called “Personal Info” and include the fields “Married” and “Number of Children” in it. You may have another form called “Deal Info” and have the fields “Deal Size” and “Likelihood” in it. When you open a Contact detail view, you’ll now see two additional tiles in it called “Personal Info” and “Deal Info” — in each one you can set the corresponding field values. Set the Applicable Statuses and Applicable Groups for a form to determine whether a form will show up for a Contact detail. If you want the form to appear in all the Contact detail views then do not set the Applicable Statuses or Applicable Groups. In the Contacts + Service topic, tap the Custom Data tile. Tap the plus sign that is in the same heading as Log Items. Add a name that describes the field, such as Height. Add a response type (such as numeric, text, date, etc. ), and unit (such a minutes, weight, etc.). Optionally add a context tag. Tap Save and repeat the process for additional fields. The field is now available for contacts. In the Contacts + Service topic, tap the Custom Log Form tile. Tap the plus sign that is in the same heading as Log Forms. Add a name that describes the form and an optional comment. To add the log items that you created in the previous steps, tap Tap to add Log Item. Select the fields that you created in the previous procedure. The form is now available for each contact in the Contacts + Services topic and the name of the form created in the procedure above becomes a new tile that you will see for each contact that has the applicable status and applicable group. If you want the form to appear in all the Contact detail views then do not set the applicable statuses or applicable groups. The log items for the form are available for you to track for each contact. Locate the custom field you wish to modify (Log Items) and tap it. Tap Configure and modify the items as necessary and tap Save. Locate the Log Form you wish to modify and tap the form. If you want to remove fields, swipe them to delete them. If you want to add fields, tap the plus sign, select the fields you wish to add, and then tap Save. If you want to reorder fields, tap the Reorder icon and drag the fields up or down. For custom fields, locate the custom log item you wish to delete, tap it, and then tap Delete. For custom forms, locate the custom log form you wish to delete, tap it, and then tap Delete. In the Contacts + Services topic, the Contacts view helps you to be more productive by allowing you to associate tasks, reminders, appointments, notes, expenses, files, and bookmarks (to websites) to contacts. For example, if you’re an Account Executive and you wish to keep notes about prospects you’re working with, you can create the notes in your LightArrow app, and associate them with the prospect. Or perhaps you’re taking care of an elderly loved one, and you need to keep track of expenses related to their care. In this case, you can attach expenses to this contact. In the Contacts + Services topic, the Service Providers view helps you to be more productive by allowing you to associate tasks, checklists, appointments, reminders, bookmarks (to websites), files, audio, photos, videos, drawings, notes, and services to service providers. For example, if you’ve hired a landscaping firm, and you have a list of things you wish to talk to them about, you might associate a checklist to the service provider. Or, if you’ve hired them to do many jobs, each of the jobs might be an attached service. In the Contacts + Services topic, the Services view helps you to be more productive by allowing you to associate tasks, checklists, appointments, reminders, bookmarks (to websites), files, audio, photos, videos, drawings, notes, and expenses to services. For example, if you’ve hired a babysitter to watch your children, you might associate a note about the experience or a receipt that you’ve saved in the Dropbox or Box. Locate or create the service from the Services view by tapping the Services tile in the Contacts + Services topic and tapping the plus sign. Open the Service by tapping it and then tapping Open. Locate the Service Provider tile and tap it. If you’ve created a new provider, add the information and tap Save. When you’re finished completing the fields, tap Save. The service and provider are now linked. Locate or create the service provider from the Service Providers view by tapping the Service Providers tile in the Contacts + Services topic and tapping the plus sign. After you open it, tap the plus sign at the bottom of the view. Choose Create New or Choose Existing from the menu depending on your choice. If you’re choosing an existing service, tap Service and select the service you want to add by tapping it. If you’re adding a new service, tap Service and add a name and start date, and then tap Full Details to add more information. Complete the information for the service and tap Save. You can create a task in the Tasks + Projects topic and associate it with a contact, service provider, or service (or) you can associate a task to a contact, service provider, or service directly from the Contacts + Services topic. For detailed information about tasks, refer to the Tasks + Projects help. Locate the contact, service provider, or service from the appropriate tile in the Contacts + Services topic. If you’re choosing an existing task, tap Task and select the task you want to add by tapping it. If you’re adding a new task, tap Task and add a name and due date, and then tap Full Details to add more information. Complete the information for the task and tap Save. You can create a checklist in the Notes + Files, Lists topic and associate it with a service provider or service (or) you can associate a checklist to a service provider or service directly from the Contacts + Services topic. For detailed information about checklists, refer to the Notes + Files, Lists help. Locate the service provider or service from the appropriate tile in the Contacts + Services topic. If you’re choosing an existing checklist, tap Checklist and select the checklist you want to add by tapping it. If you’re adding a new checklist, tap Checklist and add a name and due date. Optionally add a comment. Tap Tap to add Checklist item and add items to the checklist tapping Save as you create each one. Complete the information for the checklist and tap Save. Creating an appointment is a common function that can be created in many areas of your app. If you wish to add an appointment directly to a contact, service provider, or service, follow the procedure below. If you’re choosing an existing appointment, tap Appointment and select the appointment you want to add by tapping it. If you’re adding a new appointment, tap Appointment and add a name and start date. Tap Full Details if you wish to add full dates, invitees, context tags, associated topics, location, and to choose the iOS calendar to be associated with the appointment. Tap the tiles for the details you wish to add and complete the necessary fields. Complete the information for the appointment and tap Save. Creating a reminder is a common function that can be created in many areas of your app. If you wish to add a reminder directly to a contact, service provider, or service, follow the procedure below. If you’re choosing an existing reminder, tap Reminder and select the reminder you want to add by tapping it. If you’re adding a new reminder, tap Reminder and add a name and due date/time. If you wish to add context tags and select a calendar for an iOS notification, tap the associated tiles. You can create a bookmark in the Bookmarks + Lockers topic and associate it with a contact, service provider, or service (or) you can associate a bookmark to a contact, service provider, or service directly from the Contacts + Services topic. For detailed information about creating bookmarks, refer to the Bookmarks + Lockers help. If you’re choosing an existing bookmark, tap Bookmark and select the bookmark you want to add by tapping it. If you’re adding a new bookmark, tap Bookmark and type a URL for a bookmark or search for a bookmark and select it. You can create a file reference in the Notes + Files, Lists topic to your local and online files and associate it with a contact, service provider, or service (or) you can associate a file reference to a contact, service provider, or service directly from the Contacts + Services topic. Files can be local or stored online. For detailed information about creating file references, refer to the Notes + Files, Lists help. If you’re choosing an existing file reference, tap File and select the file reference you want to add by tapping it. If you’re adding a new file reference, tap File and select a folder and file. If you don’t see the file service you wish to use, you can set it up directly from the resulting menu by tapping New and completing the options for the file service. You can create photos, audio, or video within the Media topic (or in some cases directly with your device) and associate them with a service provider or service (or) you can associate a media item with a service or service provider directly from the Contacts + Services topic. For detailed information about creating media items, refer to the Media help. If you’re choosing an existing media file, tap Audio, Photo, Video, or Drawing and select the file you want to add. If you’re adding a new media item, tap Audio, Photo, Video, or Drawing and complete the necessary actions. Save the service or service provider. You can create a note in the Notes + Files, Lists topic and associate it with a contact, service provider, or service (or) you can associate a note to a contact, service provider, or service directly from the Contacts + Services topic. For detailed information about notes, refer to the Notes + Files, Lists help. If you’re choosing an existing note, tap Note and select the note you want to add by tapping it. If you’re adding a new note, tap Note and add a name and due date, and then tap Full Details to add more information. Complete the information for the note and tap Save. You can create an expense in the Finances topic and associate it with a contact or service (or) you can associate an expense to a contact or service directly from the Contacts + Services topic. For detailed information about expenses, refer to the Finances help. Locate the contact or service from the appropriate tile in the Contacts + Services topic. If you’re choosing an existing expense, tap Expense and select the expense you want to add by tapping it. If you’re adding a new expense, tap Expense and add a name, amount, and due date/time.